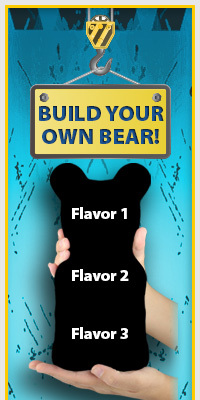 What can be better than having your favorite Big Bear!™ treat in our most popular flavors? This pack of bears includes (2) Blue Raspberry, (2) Orange, and (2) Cherry and weighs approximately ¾ pound. Keep three of the ORIGINAL, made in the USA Big Bears!™ for yourself and share three with your BFF!